The ITV reality show has seen a slump in viewers this year but it did not stop Impossible becoming the fastest selling single of the year so far, with 490,000 copies, according to the Official Chart Company. The sales make it the fastest-selling X Factor track since Alexandra Burke's 2008 hit Hallelujah. 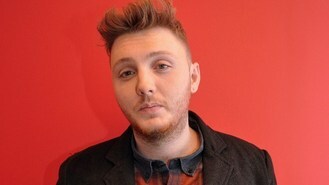 Speaking to OfficialCharts.com, James said: "To everyone from home and around Britain who bought the single, thank you very, very much. You've made my dreams come true. "The fact that it was in aid of Together For Short Lives, which is a great cause and a great charity, I think that really helped. "My Number 1 Award is going to go on my mantelpiece and I'll probably kiss it for two weeks solid every time I pass it!" It remains to be seen whether the new entry can hold on to the top spot for a second week and become Christmas number one next Sunday. A cover version of the Hollies' hit He Ain't Heavy, He's My Brother by The Justice Collective - including Sir Paul McCartney and Robbie Williams - supporting the families of Liverpool supporters killed in the 1989 Hillsborough disaster, is favourite to be the festive chart-topper. James's version of Impossible had the best opening week's sales of recent X Factor winners, outperforming Little Mix's Cannonball by more than two to one (210,000). It also outsold Matt Cardle's 2010 single When We Collide (439,000), Joe McElderry's 2009 eventual chart topper The Climb (451,000), Leon Jackson's 2007 hit When You Believe (276,000) and Steve Brookstein's Against All Odds (128,000).